This new blush from Clarins adds the perfect rosy flush to cheeks.Its soft texture reacts on contact with the skin, melting into the cheekbones to boost their natural colour and radiance, enhancing your own skin tone. The slightly iridescent pink colour suits all complexions and is great if you need a new low maintenance everyday blusher which can carry you through from summer to winter. As always with Clarins this product is suitable for even the most sensitive of skin tones and is not drying to the skin like other powder blushers can be. Additionally this blush also doubles up as a lip colour, giving a lovely subtle sheen when applied lightly. 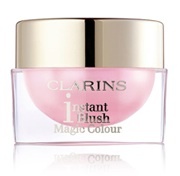 Clarins Limited Edition Instant Blush is priced at £16.50 and is available to purchase from the Clarins website.